Baroness Irayari Vairavi moved from Caid to the East Kingdom in March 2006. She was Baroness of Carolingia, Kingdom of the East, from 05/12/2012 to 04/04/2015 and her current persona is Imigla Venture, a 14th century Venetian noblewoman. Irayari Vairavi has been in the SCA since 1993. Her first event was An Tir's May Crown Tournament XXVIII. Since that time she was active in the Kingdoms of AEthelmearc (1996-1998), Middle (1998-2001), and Caid (2004-2006) before settling in the East. She is a Companion of the Lux Caidis and a Companion of the Maunche (East). Her name follows the pattern <father's name> <given name>, and it is always most appropriate to refer to her as "Vairavi" except in legal or highly formal contexts. Vairavi was born in 1264 C.E. in Tiruchendur, on the south-east coast of the Indian subcontinent (modern Tamil Nadu). At a young age she was sworn to the Nallaiappar temple in nearby Tirunelveli, and there began to learn the arts of the tevaratiyar, or temple-dancer. After a time she fell away from the religion of the Brahmans and left the temple to become courtier, poet, and tutor of Carvaka philosophy at the Court of King Maravarman Kulasekhara Pandyan. Her primary language is Tamil, although she knows a little Sanskrit as well. 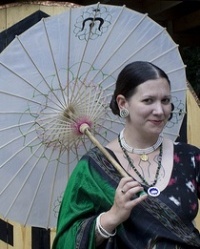 Vairavi also dabbles heavily in European costuming of various eras, and has a less-well formed secondary persona, Valeria, to explore the trade connections between India and Venice during the 13th and 14th centuries. She has also experimented with Roman, Mycenean, and late North Indian clothing. Set Decorator for East Kingdom Court, Pennsic 36. This page was last modified on 18 May 2015, at 09:58.